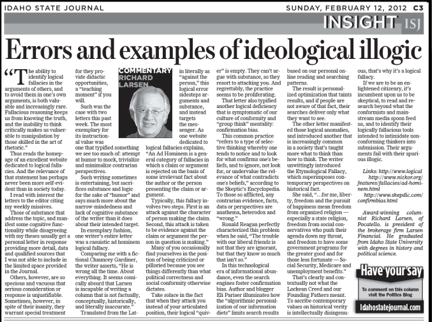 “The ability to identify logical fallacies in the arguments of others, and to avoid them in one’s own arguments, is both valuable and increasingly rare. Fallacious reasoning keeps us from knowing the truth, and the inability to think critically makes us vulnerable to manipulation by those skilled in the art of rhetoric.” Thus reads the homepage of an excellent website dedicated to logical fallacies. And the relevance of that statement has perhaps never been more self-evident than in society today. I read with interest the letters to the editor citing my weekly missives. Those of substance that address the topic, and manifest some cognitive functionality while disagreeing with my theses usually get a personal letter in response providing more detail, data, and qualified sources that I was not able to include in the limited space provided in the Journal. Others, however, are so specious and vacuous that serious consideration or response is unjustifiable. Sometimes, however, in spite of their inanity, they warrant special treatment for they provide didactic opportunities, a “teaching moment” if you will. Such was the case with two letters this past week. The most exemplary for its instructional value was one that typified something we see too much of; attempt at humor to mock, trivialize, and minimalize contrarian perspectives. Such writing sometimes is entertaining, but sacrifices substance and logic for the sake of “humor” and says much more about the narrow-mindedness and lack of cognitive substance of the writer than it does about their intended target. Many of you occasionally find yourselves in the position of being criticized or pilloried because you see things differently than what political correctness and social conformity otherwise dictates. Take solace in the fact that when they attack you instead of your articulated position, their logical “quiver” is empty. They can’t argue with substance, so they resort to attacking you. And regrettably, the practice seems to be proliferating. In this technological era of informational abundance, even the search engines foster confirmation bias. Author and blogger Eli Pariser, illuminates how the “algorithmic personalization of our information diets” limits search results based on our personal online reading and searching patterns. The result is personalized optimization that taints results, and if people are not aware of that fact, their searches deliver only what they want to see. The other letter manifested those logical anomalies, and introduced another that is increasingly common in a society that’s taught more what to think than how to think. The writer unwittingly introduced the Etymological Fallacy, which superimposes contemporary perspectives on historical fact. She said, “…for me, liberty, freedom and the pursuit of happiness mean freedom from organized religion — especially a state religion, freedom from social conservatives who push their agenda down my throat, and freedom to have some government programs for the greater good and for those less fortunate — Social Security, Medicare and unemployment benefits.” That’s clearly and contextually not what the Lockean Creed and our Founding Fathers meant. To ascribe contemporary values on historical verity is intellectually disingenuous, that’s why it’s a logical fallacy. If we are to be an enlightened citizenry, it’s incumbent upon us to be skeptical, to read and research beyond what the conformists and mainstream media spoon feed us, and to identify their logically fallacious tools intended to intimidate nonconforming thinkers into submission. Their arguments fail with their spurious illogic.